Tonight, Kevin was in charge of dinner. When I left this morning, I didn't know whether he would make one of his great stand-by dishes such as meatloaf, stuffed cabbage, or lemon chicken, or he could have decided to make Hamburger Helper. Any of these would have been good simply because he cooked. Most of the time I monopolize the kitchen and the menu for the week. He seldom gets to cook but when he does, it is usually good! 1. Heat butter over medium high heat, brown meat, which has been cut into 1/4-inch wide strips. 2. Brown the meat in 2 or 3 batches so that each batch just covers the bottom of the skillet without crowding. Remove meat and set aside. 3. Reduce heat, saute onions for 5 minutes. Return meat to skillet, add remaining ingredients except peppers, cornstarch, soy sauce and water. 4. Add peppers, which have been seeded and cut in 1/2-inch strips, simmer covered for 10 minutes. Blend cornstarch, soy sauce and water in small dish; stir into meat mixture. 5. Cook until thick and clear, about 1 minute. The bay tree is native to the eastern Mediterranean, but has long been cultivated in northern Europe and the Americas. It came to symbolize wisdom and glory to the Greeks and Roman, who crowned kings, poets, Olympic champions, and victorious generals with wreaths of its glossy, leathery leaves. Although there are several varieties of bay, only L. nobilis is used in the kitchen. Bay has a sweet, balsamic aroma with notes of nutmeg and camphor, and a cooling astringency. Fresh leaves are slightly bitter, but the bitterness fades if you keep them for a day or two. Fully dried leaves have a potent flavor and are best when dried only recently. Fresh leaves can be used from a tree, but are less bitter if kept until wilted. To dry completely, lay leaves flat in a dark, well-aired place and leave until brittle. If stored in an airtight container, dried leaves will keep their aroma and flavor for at least one year. Bay leaves yield their flavor slowly, so they are useful in stocks, soups, stews, sauces, marinades, and pickles. Bay is always used in a bouguet garni (tied bundle of bay, a few stems of thyme and parsley). It goes well with beans, lentils, and tomatoes, especially to flavor tomato sauce. Two or three bay leaves flavor a dish for four to six people. Remember to remove the leaves before serving. 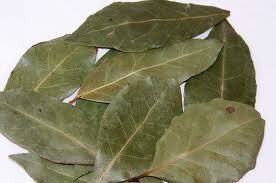 Bay leaves are good with beef, chicken, fish, lamb, citrus fruits, rice, tomatoes and white beans. They also combine well with allspice, garlic, juniper, marjoram, oregano, parsley, sage, savory, and thyme. This past weekend we had a 65th birthday party for my dad. Kevin and I prepared and cooked the food. I received this recipe from our good friend Linda. Linda has been a friend to Kevin for over 30 years and my friend for 17 years. Linda and I have many hobbies in common. She taught me how to can and we exchange recipes regularly. She has provided me with some of the best recipes I have made. A person could not ask for a better friend and I am glad she has been in our lives! She said that one of her coworkers made this salad recently and thought I might like to try it. My dad's party was the perfect opportunity. Especially since I have cucumbers that seem never ending. This salad could not be any simpler to make and the ingredient list is pretty darn short. This is a definite summer keeper! Today, Kevin and I went to a picnic and we were in charge of the baked beans and a dessert. Well, naturally, I made the Chuckwagon Beans found in an earlier post to the blog. For the dessert, I decided to make Apple Slices. No, I wasn't trying to bring fall around sooner than we should! I just thought a nice apple slice with the comfort of cinnamon in the background was just the trick. It was a great day all the way around. Spending time with the people you love, hearing the kids running around laughing and having fun, and great summertime foods! Everyone who brought dishes, hats off to you! They were all very good. 3. On a floured sheet of waxed paper; roll out the larger piece of pie dough to fit the bottom and sides of the jelly roll pan. It is easiest to do this if you fold it in half before moving it. There should be enough dough on the sides to be able to pinch together when you put on the top crust. 4. Peel and slice the apples. Taste a piece to see how much sugar you will need. Stir sugar and cinnamon in with apples. Sprinkle in the flour and stir to distribute. Put apples into dough-lined pan. Dot with butter. 5. On another floured sheet of waxed paper, roll out the other rectangle of pie dough to fit the jelly roll pan and place on top of the apples. Crimp edges on all sides and cut some slits in the top crust. Chill while preheating oven to 375˚. 6. Bake until crust is lightly browned, 50 to 60 minutes. If the crust is browning too quickly, reduce the heat to 350˚ for the last 10 minutes. 7. While apple slices are baking, combine the frosting ingredients and stir until smooth. Frost apple slices while still hot. This past weekend, Kevin and I made a trip to Minnesota for some shopping at the Mall or America along with a few outlet stores. As many of you have read, we are trying to visit as many restaurants featured on Diners, Drive-Ins, and Dives as possible. This trip was no exception. The The Blue Door Pub is located in St. Paul on Selby Avenue. Most of the patrons seemed to be college students so a school must be in the area. The pub itself is quite small and at 7:00 p.m. on a Sunday evening, the place was hopping. We started out the meal with two recommended appetizers. The first was a beer battered, deep fried green beans with a ranch dressing. The next appetizer was the "bomb." We had deep fried Spam bites. Basically, these were made by mixing cream cheese and Spam along with some spices. Once mixed the cheese mixture was refrigerated. From what we could see, they rolled the cream cheese mixture into 2-inch balls, dipped them in crushed cornflakes and deep fried them. They were served with a slightly spicy sweet-sour sauce. For something so simple, the taste was really very good. They are also known for their Juicey Blucy burger which is what I ordered. The 1/2 pound Angus burger is stuffed with blue cheese and chopped garlic. The burger was cooked to medium and quite good. I definitely would order it again. THE to-die-for burger in our opinion was the Frenchy. Kevin ordered this 1/2 pound Angus burger which is stuffed with grilled onions and swiss cheese. You think that sounds great on its own, just wait. The burger also has more swiss cheese on top with a side of French onion au jus for dipping. This could be a new favorite. Will definitely try to recreate this burger at home. Score another hit from the Diners, Drive-Ins, and Dives show! If you are every in St. Paul, we would definitely recommend visiting. We know we will go back! One of my favorite, go-to comfort foods has been and always will be this brat, egg noodle, and kraut dish. Someone I once knew turned me on to this and I have been in love with it every since. Very simple to make and a very few ingredients. You all MUST try this at some time. I have listed the ingredients with measurements. However, do this to taste. After you make this a few times, you will find out the perfect balance for you. 1. Slice bratwurst into 1-inch slices. Fry in pan with 2 tablespoons butter over medium heat. Cook until bratwurst is no longer pink. Remove from pan. 2. Boil egg noodles, drain, and keep warm. 3. Add 2 more tablespoons butter to remaining fat/butter in the pan. Add onion to the pan and cook over medium heat until slightly caramelized; about 15-20 minutes. Add 1 tablespoon caraway. Add the kraut. Saute for 10 minutes. 4. Add the bratwurst back to the pan with remaining 2 tablespoons butter. Combine. Add the cooked egg noodles. Season to taste with seasoning salt. This year we have been blessed with some of the nicest basil we have ever grown. Usually, within two weeks of planting, it dries up and dies. I think the rains this summer have really helped. There are three large plants that I will definitely try to find some way of bringing them in to grow over the winter. Pesto sauce has always been one of my favorite sauces. Unfortunately, when you buy the basil in those pre-packaged plastic containers you end up buying 4 or 5 of them to get the 2 cups packed leaves that are required. At just about $3.00 per container, the sauce could cost between $12.00 and $15.00 to make. The ingredient list is pretty simple. I did not make the sauce with pine nuts (pignoli nuts) because Kevin is not a fan of nuts. It turned out just great. 2. Blend on medium speed for about 3 minutes; occasionally stopping to scrape down sides. Blend until smooth. I saw this recipe on an episode of America's Test Kitchen. I have been wanting to try this for a long time. I am torn about the cookies. There were several great aspects to this recipe. Using the dark brown sugar gave the cookies a wonderful caramel taste. The other thing that I will not change in any cookie that uses chocolate chips is the use of the Ghirardelli Bitersweet Chocolate Chips. Terrific taste. I have always been a cake-type chocolate chip cookie. These were quite moist and chewy but flattened out when baking. The recipe did not specify to refrigerate the dough before baking. I made the recipe as listed. I will definitely try these cookies again but I will refrigerate the dough for about 45-60 minutes prior to baking. 1 ¼ cup Ghiradella Bittersweet or Hershey’s Special Dark Chips – Do not substitute! 1. Preheat oven to 375˚. Melt 10 tablespoons butter and brown butter slightly; swirling while it browns. Remove to heat-proof bowl. Whisk in remaining 4 tablespoons butter until melted. 2. Whisk sugars into melted butter. Add salt and vanilla extract. Add the eggs and whisk. Let sit for 3 minutes and then whisk until glossy. Repeat that step 3 times. 3. Whisk flour and baking soda together. Add to batter. Stir until mixed. 4. Dough will be slack and less thick than usual cookie dough. Add chocolate chips to batter. 5. Measure 3 tablespoons dough on cookie sheet. Leave at least 2 inches between cookies. Bake 1 tray at a time in middle of oven for 15 minutes or until golden around edges. The cookie will be firm around edge and soft in the center. Let cool on sheet for 30-45 minutes. The weekend my mom came up to the cabin, we had hot dogs on the grill with Chuck Wagon Beans and corn on the cob. With several ears of corn leftover, I thought what could I make with the leftover corn. We had not had soup in a while so I thought I would make Ham and Corn Chowder. I found this recipe on what used to be Recipezaar.com. The website is now Food.com and is a nice improvement to an already great site. 1. Boil water; meanwhile peel and dice potatoes. 2. Boil for about 10-15 minutes (soft but not too mushy). 3. Meanwhile, dice up ham, onion, celery. 4. In a large saucepan, saute the onion and celery in butter until softened. 5. Stir in the flour and stir until well blended, then gradually add milk. 6. Bring to a boil while stirring until thickened, about 2 minutes. 7. Stir in remaining ingredients and bring to a boil. 8. Reduce heat, cover and simmer about 15 minutes or until heated through.